As reported recently, a formal hearing called by the Work and Pensions Committee of the UK Parliament was carried out on the 12th of January 2017, in Birmingham, for a session dedicated to basic income. This hearing was recorded on video, and can be watched here. From the Work and Pensions Committee, the members present (formally named as witnesses) were Steve McCabe (Chair), Mhari Black, Ms Karen Buck, James Cartlidge, Frank Field and Craig Mackinlay. On the witness bench, supporters and critics of basic income were aligned: Louise Haagh (Reader in Politics from the University of York and co-chair of the Basic Income Earth Network), Annie Miller (Chair of the Citizen’s Income Trust), Becca Kirkpatrick (Chair of the UNISON West Midlands Community Branch), Ben Southwood (Head of Research at the Adam Smith Institute) and Andrew Harrop (General Secretary of the Fabian Society) on the supporting side, along with Declan Gaffney (independent political consultant) and Peter Alcock (Emeritus Professor of Social Polity and Administration at the University of Birmingham) on the critical side. 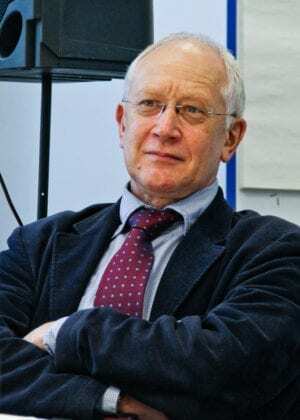 The purpose of the hearing was one of collecting evidence from experts, specifically on the issue of basic income, on which Chairman Steve McCabe noted there seemed to be a “newfound interest”. He then went on to ask whether the witnesses were for or against the idea of basic income, and why, beginning with Louise Haagh. Louise is firmly in favor of basic income, which she sees as a very important – crucial even – policy that welfare states need to implement, in order to relieve what she regards as a tendency towards more punitive strategies in present day social security schemes. Basic income can help a lot in providing “a more humane form of social security at the bottom of the welfare state”. Seated next to Louise, Annie Miller starts by undersigning all her previous statements. In addition, she points to some definitional information about basic income, such as individuality, universality and non-conditionality except that of age. Miller also clarifies that basic income is only intended to cover basic needs, not luxurious lifestyles. That implies, given regional cost variations and various personal circumstances, that for instance housing and disability benefits would still need to be kept in place, at least in the United Kingdom (UK). She closes this initial statement by saying that basic income schemes will vary depending on the policy maker’s objectives. Becca Kirkpatrick also began with her support for basic income, including the UNISON West Midlands labor union in that support. She cites ongoing discussions about basic income within the union she represents, which include a right to a dignified existence, as unconditional cash transfer, or as more widely conceived strategies to eradicate or alleviate poverty. Becca frames the question more generally not on a matter of technical or economic feasibility, but as an issue of political will, on “what the public of this country would like to see and believe they are entitled to”. Following this, Ben Southwood went on to say that, although he supports basic income, he stands somewhere slightly different in relation to the issue. He defends basic income as a simplification of the welfare state, where he sees great opportunity for reducing or eliminating disincentives to work. Cutting most social benefits and replacing them with the basic income would, in his view, allow people currently on benefits a greater degree of freedom. On his part, Peter Alcock, while recognizing basic income’s appeal as a progressive idea for society, feels that it is “too good to be true”. Afraid of the co-option of basic income by neo-liberals – as an excuse for slashing away the welfare state – he looks upon it with as a “distraction from other more pressing issues”. He was followed, and supported by, Declan Gaffney. He was also weary that basic income supporters so often defend BI with promises of unconditionality even when, when practically considered, a basic income would still need to be attached to conditions. However, he does give the idea credit as “a thought experiment”. Finally, Andrew Harrop said he was “sitting on the fence” with basic income. He thinks basic income should be seen more from a tax reform prism, rather than a change to social security. Harrop ultimately envisions a kind of hybrid system that combines universal unconditional cash transfers with means tested benefits for those “who have earned entitlement”. 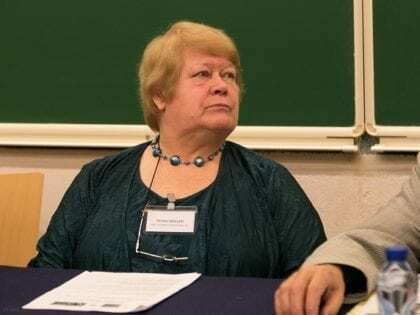 Ms Karen Buck then raised the question of work and basic income: in an increasingly unstable labor market, with lower and less certain incomes accruing from work – how serious should these tendencies be regarded, and how might basic income address them? Declan Gaffney, in reply, doubted that, given the previous economic instability, we were witnessing permanent job loss due to technological change. In this he adhered to the views of others like Alan Manning. 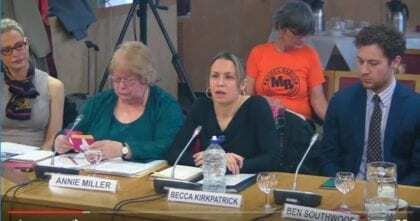 This was followed by a short discussion between Ms Karen Buck and Becca Kirkpatrick, over if the problem was the existence of conditions within the system, or the absence of the system. According to Becca, the system does not exist, not in a way as to “prioritize guaranteeing for everyone”, and went on to state the premises and broad results of UNISON internal debate on the issue of basic income. That survey, she says, has exceeded expectations as to the level of support for the idea, in general terms. At that point, James Cartlidge joins the conversation, asking what he thinks is “the most important question”: how generous will this basic income be? Ben Southwood then introduces the issue of basic income versus the negative income tax issue. After clarification of the differences between these two systems of cash transfer, Annie Miller points out that the “housing benefit is not a problem of the basic income, it is a problem of the housing policy”. However, James, and to a certain extent, Peter Alcock state their opposition to basic income on a more fundamental basis: that people will not work if given a sufficiently generous basic income. James Cartlidge is also not convinced (about basic income), as some models, according to him, result in greater poverty with basic income. Mhairi Black then raises the question of effects on the labor market, which she fears will be one without pay raises, if basic income is implemented. Louise doesn’t agree, arguing that people, with increased bargaining power, will only do difficult, unpleasant tasks if paid more to do them. On the other hand, going back to the quantitative value of basic income, Annie Miller reminds that 60% of the median equivalized household income is a good benchmark for quantifying the basic income in any given region, and elucidates about ways to finance it within the UK tax context. She goes on to state that this should actually be inscribed into a national constitution, if only the UK had one. On that point, Andrew Harrop states his preference for a hybrid tiered system, with both conditional and unconditional elements in it, plus some contributory part (for pensions and/or unemployment benefits). Becca Kirkpatrick then introduced the issue of working conditions – on a general basis but also based on her own experience – which she thinks need to be addressed urgently, and strongly believes basic income is the way to do it. Louise then weights in by underlining that a basic income does not need to be a substitute for work regulations, nor to contributory benefit regimes. The two can go along in the same direction, one of reducing conditionality, complexity and punitive actions. Craig Mackinlay from the Work and Pensions Committee was himself generally against the idea of a basic income, especially on the grounds that it will discourage work, plus it could increase poverty. Declan Gaffney, although also an opponent, recalls a study for the USA in which a 55% tax rate is applied to fund a basic income. Ben Southwood, on work changes due to basic income, sees a mixed effect which might somewhat reduce working hours – especially for single women with children – but at the same time increase income for extra hours worked. At this point, Louise introduces the calculations done by Malcom Torry, of the Citizen’s Income Trust, to fund a basic income in the UK, which predicts a 60£ a week for everybody, financed by progressive tax rates of 23% for incomes up to 42000£ per year, 43% up to 150000£ per year and 48% above that. As final remarks, Andrew Harrop re-stated his vision of a hybrid social security scheme incorporating conditional and unconditional parcels. Declan declared himself reluctant to accept conditionality in the social security system, as well as some backstop sanctions regime. However, because he thinks basic income will discourage people from working, he favors a more traditional employment framework, with “permanent contracts, with proper in-work benefits with entitlements to holiday pay, sick pay and so on”. Peter Alcock firmly set his case against basic income, as something unachievable or that “isn’t worth pursuing”. Ben also concluded in support of basic income, although from a different point of view from other supporters. According to him, there is no principle distinction between a basic income and a negative income tax. Becca Kirkpatrick went back to fundamental philosophical grounds justifying basic income, by saying that it “could have an interestingly powerful, new cohesive effect on society that we are yet to really experience”. She also rested her case with a unifying message that, effectively, the human species needs badly to unite, helped by such a policy as basic income, to address all other challenges it is facing in the world today. 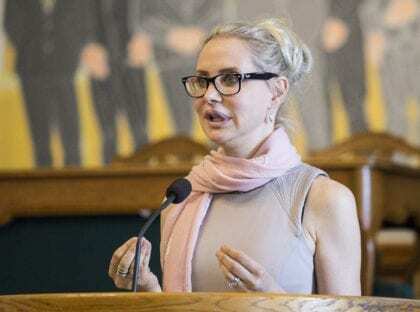 Annie Miller wrapped up her position by clarifying that, under a basic income scheme, higher earners are net payers of basic income, not receivers. She also added the important aspect of gender inequality, so much in favor of men presently, and that would be made more fair and realistic with basic income, paid individually. She still had time to summarize the current system, which she claimed is “just a regressive system”, and went on to point out that “we have freedom of choice for rich people but not for poor people”. Finally, Louise Haagh presented her closing statement underlying that, although with different views on the subject, the whole witness panel seems to show consensus that the benefits system needs changing. And that change will inevitably go towards basic income, if it is to become less punitive and more humane.